Many of the children I work with (especially those at junior age) have difficulty with word-finding. This is something that we all experience occasionally, so I think everyone reading this will be able to identify with how frustrating it can be at times. You know that “tip of the tongue” feeling that you get sometimes when you can’t quite remember someone’s name or a word you’re trying to think of – that’s a word-finding difficulty. For most of us, this might happen occasionally for familiar words and names, or more often with more complex words that we don’t use as often. It happens to us all a little more as we get older and particularly if we’re tired or distracted (I’m sure that for the first couple of years of my daughter’s life, I experienced word-finding difficulties every other sentence – a little embarrassing when you’re a speech and language therapist!). For some people though, this can affect them all the time when they’re trying to say something. They know what they want to say, but just can’t bring the right words to the forefront of their mind. For some children, this might make them “ramble”. They talk and talk around a topic, but don’t really get to the point because they can’t think of the words. For others, they might speak very slowly, or start sentences and just give up. For still others, they might use filler words and “non-specific language” a lot. This is a phrase I write a lot in reports. I mean that a child says things like “I saw that thing next to it.” They have the sentence structure right, but not the specific vocabulary. In any of these cases, it can be difficult for the child to get their message across. First of all, we need to make sure the vocabulary knowledge is secure – I mentioned earlier that we are more likely to remember words which are familiar to us. So, if a child is having difficulty recalling words, it’s good to do extra repetition of new words to really embed them into the brain. This is often referred to as “overlearning”. You can find more information about teaching vocabulary here. Secondly, if I have forgotten a word, I might try to cue myself into it with information I can remember. For example, if I have forgotten someone’s name, I might remember that it begins with “J” or that it’s a short name or an unusual name. If I have forgotten a word, I might describe it to help myself remember or so that the other person can understand. For example, I might say “the cold thing in the kitchen that you put milk in…the fridge!”. So, we can teach children to use these same skills to help themselves and their listeners when they get stuck. Therefore, with children with word-finding difficulties I do lots of description activities and work on phonological awareness (awareness of sounds in words, syllables etc). Find a set of pictures – any picture cards you have at home will do or find some pictures on the internet. Take half each and take turns to describe a picture for the other person to guess what it is. Talk about what makes a good clue (eg “it’s black” isn’t a helpful clue for a cat, but “it says meow” is). Talk about similarities and differences between different things. EG you could find two things around the house and think of something the same about them and something different (eg a sock and a glove are both clothes but a sock goes on your foot and a glove goes on your hand). You can also try this the other way round – name 3 or 4 things in a group and see if the child can identify the group (eg apples, grapes and bananas are all ….). One final thought – if your child struggles with word-finding, comment on it when you yourself can’t think of a word straightaway. This will hopefully help them to see that everyone finds it hard from time to time and help their self-esteem. What do you find helps your child or the children you work with? Do add your ideas and experiences here too. A large number of children & young people I work with use sign language (we use Sign Supported English) to help with word retrieval – signing cues them in to ‘find’ the spoken word. Hi Toni. Thanks for your comment. I’m glad you found the post helpful. Visuals of all kinds can really help children with SLI, as has been pointed out in another comment, signing can also really help. You are so right about helping a child to find strategies that they can use independently, so that they can communicate as successfully as possible wherever they are. Thanks for reading. 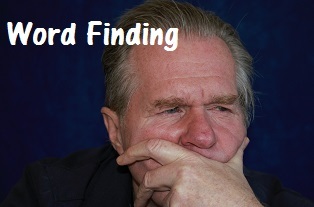 a SLT with a special interest in word finding difficulties isn’t easy. There are a number of questions/ issues here! My first comment would be about the use of ‘within normal limits’. On the CELF this can be scores between 7-13. If a child is scoring 7’s, although this is the low end of normal limits, it can still indicate that they are having difficulties in specific areas. You also need to check if just a few subtests have been completed or all the subtests necessary to gain an overall score. In terms of assessments for language disorder, some sections of the ACE (assessment of comprehension and expression) are useful (depending on when your son turned 11). There are also other assessments for older children. A classroom observation would also hopefully highlight some of your other concerns and look at your son’s ability to process language in a busy environment. If you find a therapist that specialises in language difficulties, they would be able to highlight all of this in a report. A while ago, some LEA’s didn’t accept Independent therapists reports, however more and more will now accept them and take on board the recommendations. You can find therapist through the ASLTIP website. You could speak to some local therapists and see what their experience with your LEA is and also check their experience with language disorder before you proceed. If you would like any other information you can email us at speechbloguk@gmail.com. Good luck.